Join us for a 7 night/8 day yoga retreat in paradise on March 15-22, 2014. This retreat will rejuvenate your body, mind and spirit. Held at the luxurious Xinalani Retreat Center located on the south shore of Banderas Bay, near Puerto Vallarta, Mexico, Xinalani is built on the unspoiled jungle with a beautiful, pristine beach. It’s only accessible by boat, so be prepared to get your feet wet as you step out of the boat and onto this secluded, private resort. We’ve made travel super easy. We will meet at the Puerto Vallarta airport and will have a private shuttle take us directly to the dock and then take a private boat ride to Xinalani. The resort is 12 miles south of Puerto Vallarta Airport. Important for us yogis, this resort is eco-chic – meaning that it combines luxury with the most thoughtful care for the environment. Our yoga retreat, Yoga in Paradise with Suzanne Morgan, will focus on incorporating the wisdom and beauty of nature to lead us to better health, prosperity and peace of mind. Space is very limited, so please sign up now. Deposit of $300 will secure your space. Not included: Airfare to and from the retreat, daily excursions, alcoholic drinks and hotel gratuities. I hope you can join me for a trip of a lifetime! let’s swim with the dolphins! Many of you joined our February 28 Day Yoga Challenge. I received wonderful feedback from many of you saying how much better and calmer you felt with a consistent practice. I also received great reviews on my healthy recipes, so I’ll post more recipes in April. I’ve really been enjoying creating the asana videos for you. And I’m getting better at filming thank goodness. Invite your friends or family to join in. To get my daily tips, videos and recipes, simply join my list – click on the button on the upper right side of our main page. Join us for a 7 night/8 day yoga retreat in paradise on March 15-22, 2014. This retreat will rejuvenate your body, mind and spirit. 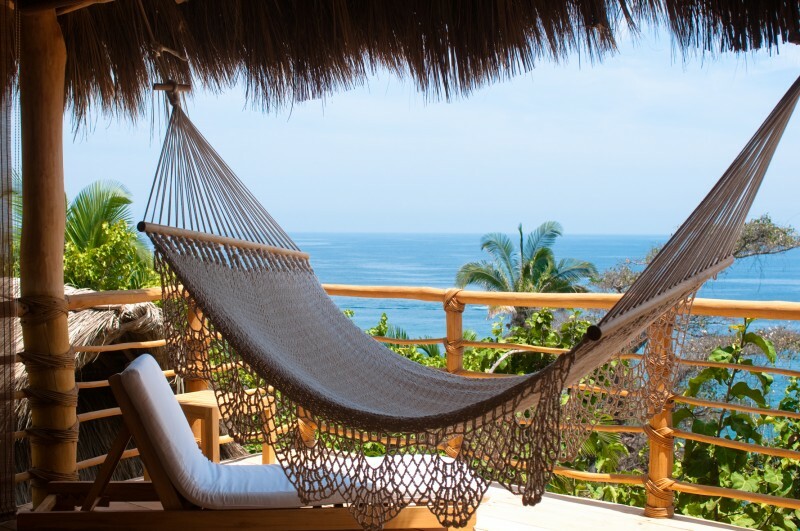 Held at the luxurious Xinalani Retreat Center located on the south shore of Banderas Bay, near Puerto Vallarta, Mexico, Xinalani is built on the unspoiled jungle with a beautiful, pristine beach. It’s only accessible by boat, so be prepared to get your feet wet as you step out of the boat and onto this secluded, private resort. We’ve made travel super easy. We will meet at the Puerto Vallarta airport and will have a private shuttle take us directly to the dock and then take a private boat ride to Xinalani. The resort is 12 miles south of Puerto Vallarta Airport, so as long as your flight arrives by 4 pm, you’ll be able to spend each night at Xinalani. Important for us yogis, this resort is eco-chic – meaning that it combines luxury with the most thoughtful care for the environment. Our yoga retreat, Yoga in Paradise with Suzanne Morgan, will focus on incorporating the wisdom and beauty of nature to lead us to better health, prosperity and peace of mind. Space is very limited, so please consider signing up early. It may seem that March 2014 is a long way off, but many people are securing their rooms now with a $300 deposit (fully refundable until four months out). We will sell out of space. Not included: Airfare to and from the retreat, transfer to and from the airport ($100 extra), daily excursions, alcoholic drinks and hotel gratuities. To secure your room, you’ll pay a $300 deposit for each person. This deposit is fully-refundable if you cancel by December 15, 2013.